The reasons a dog suffers with dry skin and coat are numerous from poor nutrition, allergies, dehydration, parasites, nerves, stress and environmental irritants. There is much that you as the dog owner can do to treat your dog’s dry skin and coat, beginning from the inside out with good nutrition and care. Wet your dog thoroughly and apply the special shampoo all over the body. Use a shampoo enriched with Vitamins A and E, humectants, wheat and oat proteins. Shake the shampoo well. Apply enough shampoo to form a rich lather and work it deeply into the coat and skin. Leave the shampoo on for five minutes. Rinse with tepid water and repeat. Rinse well during the final rinse so all soap is removed. Do this process once a week until the condition subsides. Massage a conditioner on your dog which contains Vitamin E, Chamomile, oat protein and safflower or sunflower oils. Spread a liberal amount of the conditioner all over the dog and allow it to penetrate in the skin and hair follicles for three minutes to allow. Rinse very well. Use after each shampoo. Pat your dog with a soft towel to remove excess water. Use a blow dryer on a warm to cool setting to finish the drying process. Brush your dog daily with a soft-pin brush. Daily brushing helps with circulation as it stimulates your dog’s own natural oils for healthy skin and coat. Proceed with a comb on dogs with longer coats to guarantee no mats in the fur. Provide your dog with a diet that contains a good high-protein source without by-products. The best dog food is one that has limited ingredients and no grains. A nutritional diet with minimal ingredients lessens the chance for allergies, which are most often caused from grains, preservatives and dyes. Supply supplements of Omega-3 and Omega-6, which work to prevent itchy, flaky skin. These supplements can be found in some special foods or purchased separately to add to your dog's diet daily. Add additional nutrients to your dog’s daily diet with supplements of Vitamins C, E & A, which work in combination to grow and repair healthy body tissue, maintain collagen and enhance good cell production. These supplements help to fight off infections and viruses as well as adding the mineral zinc in the dog’s food. Provide an ample water supply for your dog. Hydration is imperative for good healthy skin and coat. Handle your dog gently during the bathing and drying process. 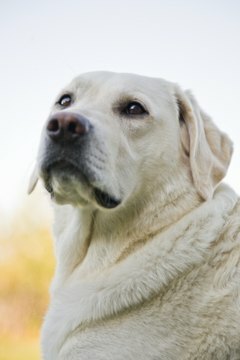 Because of the dry skin condition, your dog may feel sensitive to the touch during the treatment and healing regiment. Amount of shampoo and conditioner to use depends upon the size of the dog and amount of fur. Dogs with little fur can benefit from a rubber-tipped brush to further stimulate their natural oils.